Honorable mention, First Annual SUSNFS Photo Contest, 2005. 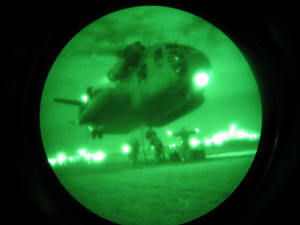 CH-53 Sea Stallion on NVGs. Photograph taken by Flight Surgeon Lieut. Peter N. Lombard. The Naval Aviation Safety Officer Course is a twenty-three day course designed to prepare aviation safety officers, as defined in OPNAV 3750, to assist commanders and commanding officers in conducting aggressive mishap prevention programs. When the ASO completes this course he/she will be able to investigate mishaps, organize and administer a squadron mishap prevention program, identify hazards, manage risks and analyze safety information. 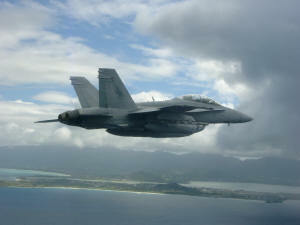 The content of the Aviation Safety course is heavily influenced by the OPNAVINST 3750.6 Naval Aviation Safety Program. The School of Aviation Safety believes that operational safety is a key component of combat readiness. As such, Operational Risk Management (ORM) is embedded throughout the ASO curriculum. Upon completion of the ASO course, the student will be designated an Operational Risk Management (Instructor) or ORM(I). ORM was introduced into Naval Aviation in 1995 and implemented into the ASO curriculum that same year. During the past decade, ORM has evolved and become an integral part of naval operations, training, and planning. ORM is formalized in OPNAVINST 3500.39A / MCO 3500.27A. Attendees arriving at ASO School are expected to have a solid understanding of ORM fundamentals. The ORM sessions of the ASO course begin with the assumption that the student has completed initial fleet ORM training. We build upon that foundation. For more information, see the web page on the School of Aviation Safety. Honorable mention, First Annual SUSNFS Photo Contest, 2005. F/A-18 Hornet on final approach. Photograph taken by Flight Surgeon Lieut. Daryl J. Sulit.